Richard Dadd was born August 1, 1817 in Chatham, Kent, England. At age 13 the family moved to London, and in 1837, Dadd, age 20, was admitted to the Royal Academy of Art. Dadd showed talent at the Academy and gathered a number of painterly friends, known collectively as 'The Clique'. He won several awards while at the Academy, and began exhibiting his work during his first year. In 1841, he received a commission to do the woodblock illustrations for a book called the Book of British Ballads, as well as an oil painting called Titania Sleeping, which is perhaps the best example of his early work. Overall, his style was not particularly remarkable, no more so than any other moderately gifted painter in Victorian England during the stylistic phase now referred to as "The Fairy School". The Victorians were obsessed with fairy lore, and much of the art of this period reflects this. Their fascination can be attributed to several things, chief among them perhaps being the effort to rediscover their folkloric past; an emergent spiritualist movement, as witnessed by the founding and flourishing of such groups as the Masons, the Golden Dawn and the Theosophical Society (in fact it was the Theosophical Society that published the now infamous Cottingley Fairy pictures, authenticated by Sir Arthur Conan Doyle and later found to be a hoax perpetrated by 2 young girls (9 and 11 years old, respectively). Or, as one modern author has perhaps a little cynically put it, it could also easily be attributed to the newly available hallucinogens at a time when the world was only lit with oil lamps and gas jets. After this encounter, Dadd began to suffer from persistent headaches and odd behavior which his travelling companion attributed to "sun stroke". In Rome, Dadd expressed a near uncontrollable urge to attack the Pope during a public appearance. Leaving Rome, Dadd began to act with increasing violence towards Phillips, and by the time they had reached Paris in late spring of 1843, Dadd's behavior could no longer be discounted as the effects of too much sun. Dadd left Phillips and returned to England, where his family had a physician specializing in mental illness examine him (Dadd's brother had been acting strange of late as well.) The doctor found him to be "non compos mentis", legally not of sound mind. Unfortunately, instead of being institutionalized, Dadd convinced his father that all he needed was a rest, and together they travelled to a country village called Cobham, where Dadd claimed that he would "disburden his mind" to his father. Dadd immediately fled to France, not even changing his bloodstained clothing until his arrival in Calais. Meanwhile, back in England, the authorities, having found Dadd's father, were now busily searching the area now known as "Dadd's Hole" for signs of Richard, whom they feared had fallen victim to the same murderer. It was not until his brother in London was notified of the murder that Richard was even considered a suspect. When the police searched Dadd's apartment in London, they found Dadd's sketchbook full of portraits of his friends and acquaintances, each one depicted with their throat slashed. Based on this incriminating evidence, his likeness was circulated, but of course, it was too late. Dadd travelled to Paris, where he promptly attempted to slash the throat of a fellow tourist. The French authorities arrested him, and Dadd volunteered his real name, and confessed to the murder of his father. Dadd was imprisoned, and later, when transferred to an asylum, the authorities found secreted on his body a list of people "who must die", with his dear old father being number one on it. Dadd was sent to England in July of 1844 for trial and was committed to the famous insane asylum known as Bedlam, at age 27. The Bethlem Hospital (Bedlam was a corruption of the name) was founded by an order of monks called Saint Mary of Bethlehem in 1247, located in Bishopgate, London. It still serves as an asylum to this day, though it has changed names and locations. The Museum of London had an exhibition of photographs and other items commemorating the asylum's 750th anniversary in 1997. Dadd was diagnosed with what is now known as bipolar manic depression, an ailment which has affected a great number of famous people over the centuries. 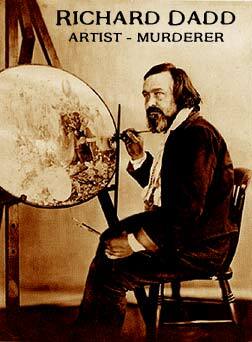 In the asylum, the doctors encouraged him to continue painting, which he certainly did, but Richard Dadd had entered a new era in his painting career. It was here that he executed such masterworks as Fairy Feller's Master Stroke and Contradiction: Oberon and Titania. Fairy Feller, or more properly, by its full title: Fairy-Feller's Master-Stroke. Painted for G. H. Hayden, Esqr by Rd. Dadd / quasi 1855 - 1864, is a painting of only 54cm by 39.4cm, and arguably one of England's master works. Dadd referred to it as 'quasi', because in his estimation, it was unfinished, though he spent nine years painting it. There is no possible way that Fairy-Feller can be properly reproduced in any medium. It is literally three dimensional, so thick are the layers of paint that Dadd painstakingly applied. Using a magnifying glass, Dadd worked in minute, obsessive detail, even the original painting, which is in London, a part of the Tate Gallery collection, needs to be displayed with 'raking light' in order to be properly appreciated. When Dadd finally stopped work on the painting, he immediately reproduced it in watercolor, and wrote a bizarre verse guidebook for it entitled Elimination of a Picture and its subject - called The Feller's Master Stroke. The guide starts with: "We'll now advance these folks displayed as in a trance...", and goes on to assign each of the hundreds of even minor characters a separate task. The painting itself is a tribute to harmony and balance and elements are repeatedly mirrored and contrasted. An example of this balance can be seen by the portrayal on the left side of two "wenches rather smart" and on the right, two corresponding well dressed males. If you come across a good reproduction of the painting, you may even be able to make out a tiny satyr in the undergrowth beneath the skirts of one of the women, leering upwards. Dadd's later paintings have a multilayered detail than takes hours to appreciate. What is unfortunately lost in reproduction is the true three dimensionality of canvas, a case of subject and technique being perhaps a little too intimately intertwined. Dadd stayed in Bedlam for almost 20 years, later transferred to another asylum called Broadmoor, where he remained for the rest of his life, dying at age 69 from "acute lung disease". Would we have remembered Richard Dadd, had he not gone insane and murdered his father? Most likely not. Like the Marquis de Sade, who spent the final years of his life in an asylum, the institution allowed him to explore his internalized passions to their fullest. In the institution, Dadd, had no models to work from, only his memories. The painted world became the real one, much like the Marquis with his writings. It was truly his insanity, not for the notoriety it gave him, but the intensity of focus it allowed, that made him great. Victorian Fairy Painting by Jeremy Maas (ed). 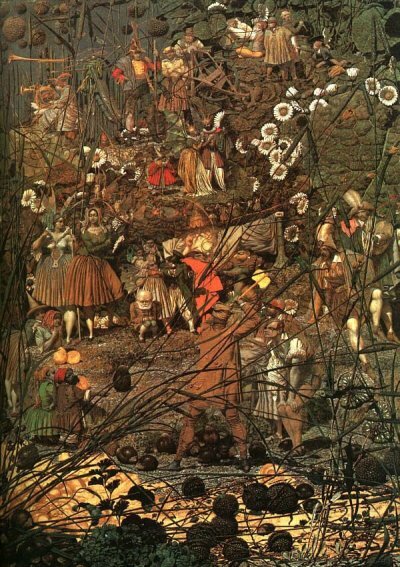 Includes a section on Richard Dadd's work, currently out of print. The Discovery of the Art of the Insane by John M. MacGregor. A seminal study into the creative impulse of the insane. Lots of interesting people covered here, including Richard Dadd. Fairies and Elves Tattoos: Actually these look pretty awful, but hey, they're only $1.50 from Amazon! The Official Brian Froud website: www.got-goblins.com. If you don't know who Brian Froud is, then you don't know anything about Faery art. 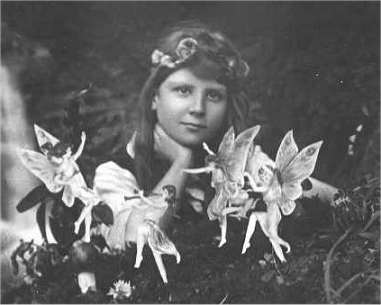 * copyright information for cottingley fairies photo: This image is in the public domain in the United States, as it was first published in the United States prior to January 1, 1923. PopSubculture.com is hosted in the United States, and although we strive to respect copyrights at all times, we have chosen to display this photograph, as we are legally entitled to do. © 1999 - 2004 PopSubCulture(dot)com. All rights reserved. All lefts on a first-come-first-serve basis. The Biography Project has had tens of thousands of visitors since july 1, 1999.